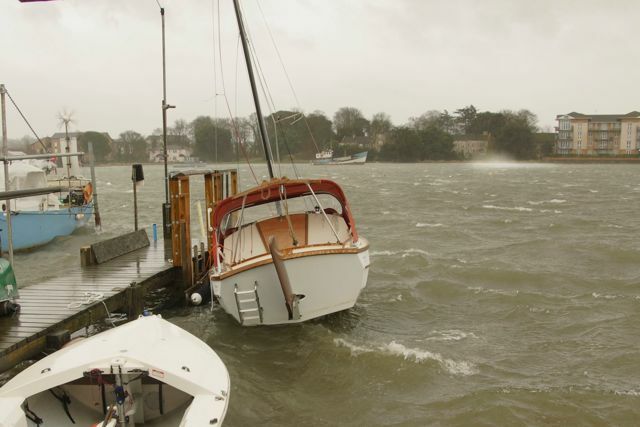 Winter Gales: As soon as Seatern was delivered, the end of December 2013 through to February 2014 brought a spectacular series of storms. 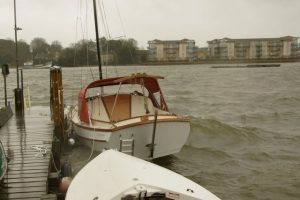 Some of the strongest winds experienced on the River Itchen coincided with storm surge tides, and houses near Priory Hard were flooded on St Valentines day night. Fitting out Seatern during this period was not easy and it took till the end of February. The day before Seatern was delivered there was a fierce gale. Within 2 days of delivery the next gale came through. Fortunately the large fender board I had installed worked well. Gales continued through January and February 2014 and the fender board gradually wore away at the jetty piles! 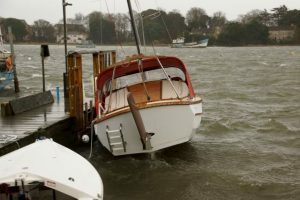 Seatern survived with only a small nick on the port bow toe rail. Seatern’s first gale (23rd December 2013) was accompanied by a storm surge which raised the river so that it was level with the jetty boards during the high tide period.